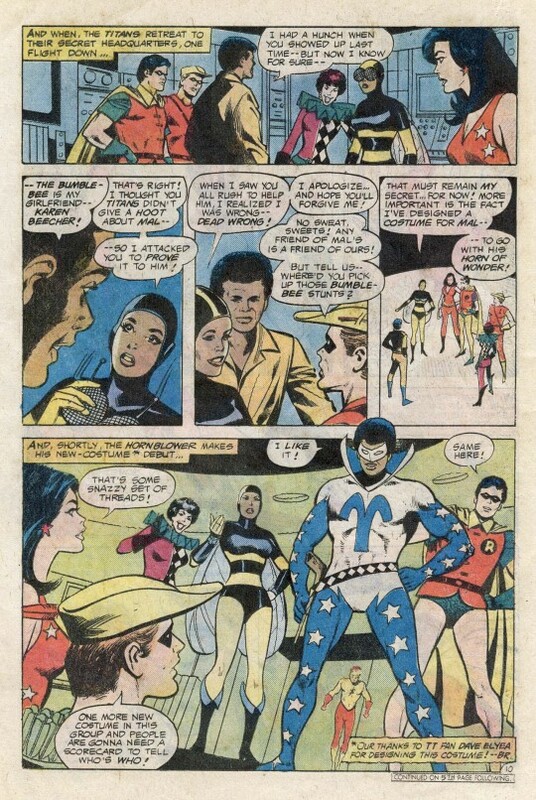 The story goes that DC cancelled this iteration of TEEN TITANS not because it was selling poorly, but because incoming published Jenette Kahn was so embarrassed by it. I’ve always been a little bit skeptical of that story (but only a little–I’ve known incoming EICs who’ve spiked titles because they didn’t like them personally) but this particular issue makes a decent argument for it. It’s pretty crummy. 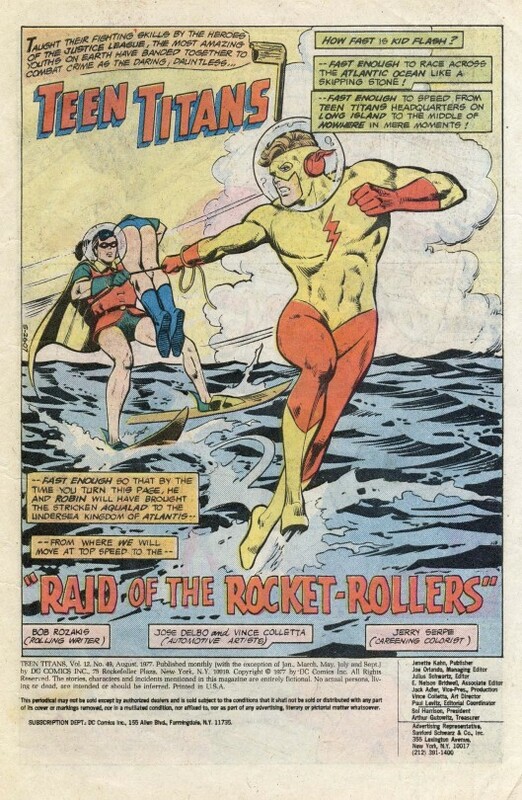 The issue opens with Kid Flash and Robin carrying their stricken teammate Aqualad to Atlantis. Last issue, they’d found Aqualad in his makeshift tank, which had completely dehydrated, and so he’s in need of medical attention. In Atlantis, the medical staff treats Aqualad, indicating that he doesn’t have the Hydro-Asian flu at all, but rather just a simple case of dehydration. This doesn’t really track with previous issues–and the truth of it is never revealed before the series ends–but it’s enough for Aquaman to blame the Teen Titans for his protege’s condition. Meanwhile, back on dry land, the opening of Gabriel’s Horn, the new disco in Farmingdale NY that will double as the Teen Titans’ headquarters, is disrupted by the arrival of the Rocket Rollers, a quartet of skateboard-riding toughs–or as tough as anyone can be while riding a skateboard and wearing a red-and-pink jumpsuit. 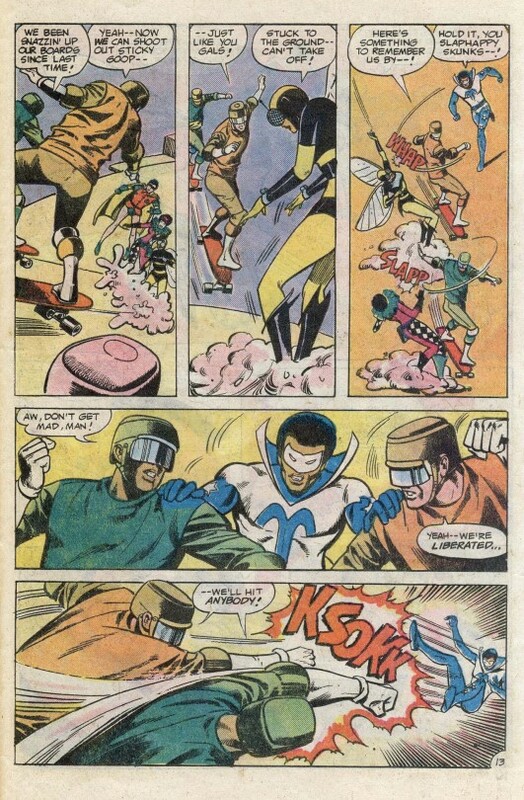 It’s unclear why the Rollers have chosen to attack this new Disco, but the Titans don’t wait for explanations before donning their costumes and getting into the fight. Karen has so changed her tune on Mal’s heroism that she’s designed a new costume for him to use in his Hornblower identity. Actually, it was designed by reader Dave Elyea. And it is hideous! How hideous? 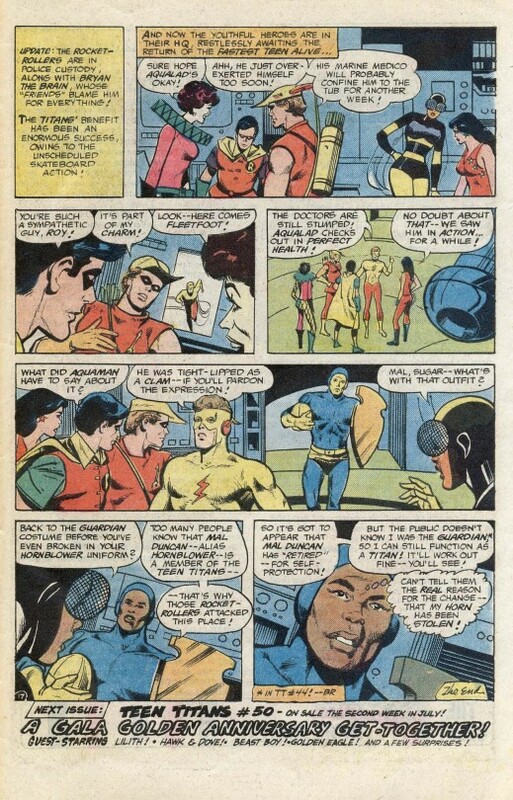 Mal only wears it for a few panels and ten shows up at the end of the issue back in his Guardian costume, claiming that his horn of power had been stolen. Yeah, sure, Mal, we know this was all about getting out of Karen’s grotty threads. Cutting to the Rollers in their hideout, we discover that they’re a quartet of young thugs given their souped-up skateboards by genius kid Bryan, who blames the popularity of the Teen Titans for why he can’t get a date. Yeah, I know. The four other guys go along with his instructions, but they’ve got a side-operation where they’re robbing the places Bryan tells them to hit as well. A week later, the Titans are putting on a public appearance when the Rocket Rollers attack them again. 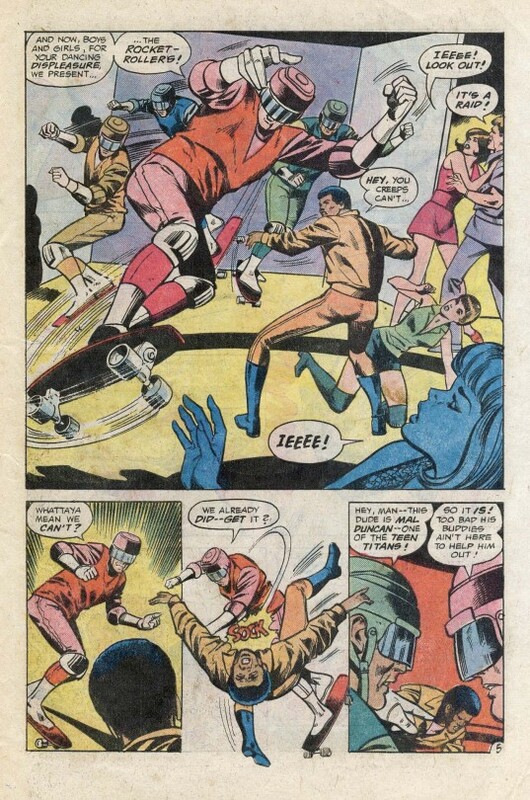 And once again, the quartet of kids on skateboards makes monkeys out of the Teen Titans for pages. 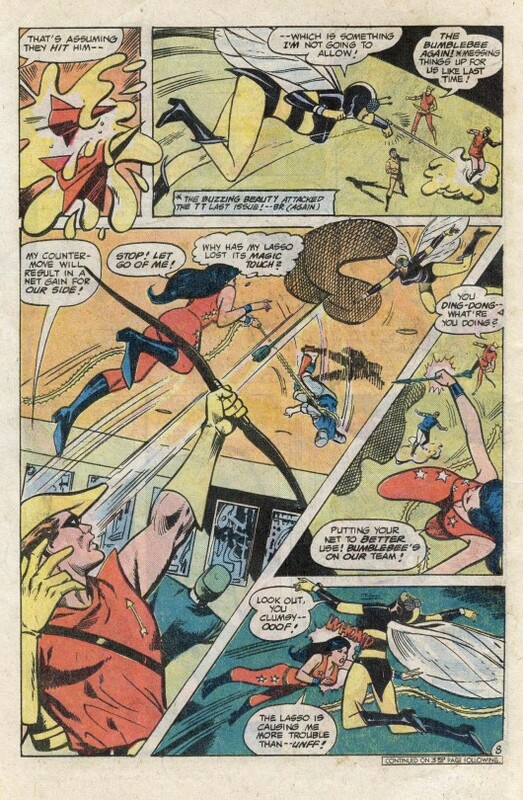 Eventually, they go to make their escape and Kid Flash pursues them. You’d figure that this chase would be over in a matter of seconds, but you’d be wrong. The Racers’ skateboards convert into surfboards, allowing them to skim across the surface of the water. 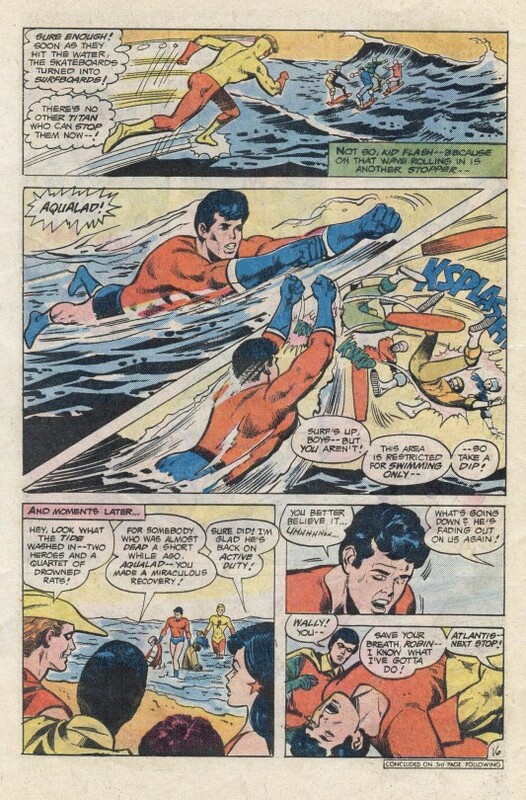 Bad move as it turns out, as a recovered Aqualad appears, and topples the Rollers–only to himself keel over again mysteriously as soon as he leaves the water. Something is clearly going on here, but we may never learn quite what. Then comes a final page that, to my eye, looks like it may have been added after-the-fact or completely changed for a change of direction. The wrap-up of Bryan and the Rollers is given a caption, Mal turns up wearing his Guardian duds again (It’s the Hornblower costume, admit it, Mal!) and Aqualad is once more back with the doctors in Atlantis.So it’s maybe not the worst comic book ever done, but it’s in no way good. Muddled, simplistic motivations, fight scenes masquerading as plot, character directions turning and turning again on a dime–this thing is a bit of a mess.